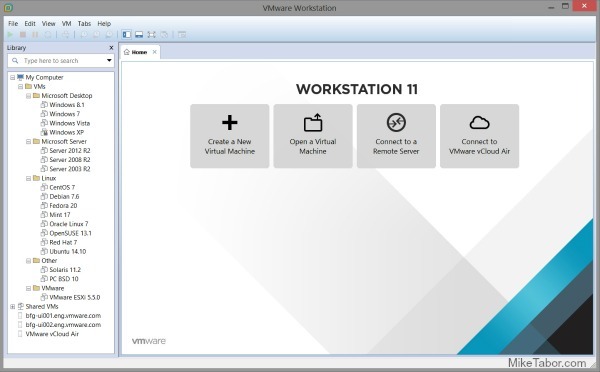 VMware has just announced that VMware Workstation 11 will be released as general availability come December 2014! VMware Workstation 11 will offer support for the latest version of Windows and Linux operating systems, running on the latest CPU’s and computer hardware while also now able to connect to VMware vCloud Air! Windows 10 Tech Preview Ready: VMware Workstation 11 can run hundreds of operating systems including the latest Microsoft Windows 10 Tech Preview. Technical users can also run the latest Linux distributions including Ubuntu 14.10, RHEL 7, CentOS 7, Fedora 20, Debian 7.6 and many more. Improved State of the Art Performance: VMware Workstation supports the latest Intel 64-bit x86 processors, including the new Haswell microarchitecture for maximum performance. Taking advantage of key new Intel Haswell extensions, Workstation 11 also delivers up to 45 percent improvement in CPU intensive operations like multimedia and encryption/decryption compared to Workstation 10. Large Virtual Machines and Better Graphics: Workstation 11 will now support virtual machines with up to 16 vCPUs, 8 TB virtual disks, 64GB memory, and now 2GB of video memory which graphics intensive applications will take advantage of the additional boost of video memory. Connection to VMware vCloud Air: Connect to VMware vCloud Air to extend and scale virtual machines on a public cloud. Developers can easily connect to VMware vCloud Air and upload, run, and view virtual machines right from the Workstation interface to easily collaborate with remote team members and scale through a public cloud. 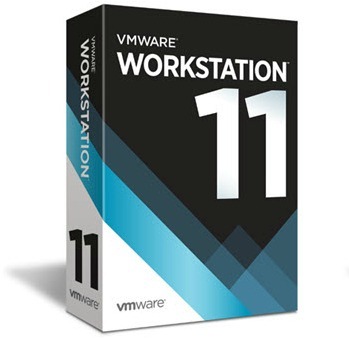 VMware Workstation 11 will be available for purchase in December for $249.99 while upgrades from Workstation 9 and 10 to Workstation 11 for $149.99. Those who buy Workstation 10 between October and December 2014 will receive the Workstation 11 upgrade for free! For more info about the free upgrade be sure to view the upgrade page. In addition to the VMware Workstation announcement, VMware has also announced VMware Player 7 will be available in December as well. VMware Player 7 Pro is licensed for commercial use and is enabled to run restricted virtual machines created by VMware Workstation 11 and Fusion Pro 7. Enhanced Operating System Compatibility: VMware Player 7 Pro will run on the latest release of Windows including Windows 8.1 and will support prevalent operating systems like Windows XP and Windows 7 in a virtual environment so users can continue to run legacy applications as long as they need. Greater Hardware Compatibility: VMware Player 7 Pro will be optimized to run on today’s modern hardware including the latest PC laptops and high-resolution tablets. Updated VMware Compatibility: VMware Player 7 Pro will be able to run restricted virtual machines created by VMware Workstation 11 or VMware Fusion 7 Pro. Restricted virtual machines secure corporate desktops with encryption, runtime password protection, USB access restriction, isolation between the host and guest OS, and time limitation. VMware Player 7 Pro will be avilable for $149.99 and upgrades from Player 6 Pro running $79.99.